Recently 1. FC Nürnberg signed striker Daniel Ginczek to a three-year contract from Borussia Dortmund for an undisclosed fee. Ginczek has been given the number 11 shirt previously worn by the Nürnberg great Marek Mintal, who was Bundesliga scoring champ once and 2. Bundesliga scoring champ twice during his time with Der Club. Thus there are already expectations for Ginczek, who during last season’s loan spell at 2. Bundesliga side FC St. Pauli scored 19 times in just 33 matches in all competitions. Ginczek was born in Arnsber, Germany on April 13th, 1991. 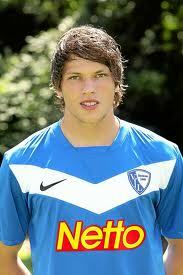 He played youth football for his local club, SC Neheim, joining the club when he was just four years of age. Ginczek stayed there for over a decade before he made the move to Borussia Dortmund in 2007 when he was 16. The 6 foot 2 striker continued to develop his game in the youth system there until he got promoted to the reserve team. In 66 Dortmund reserve matches, Ginczek found the back of the net 28 times. Borussia Dortmund would send him on loan for the entire 2011-2012 season to VfL Bochum, where he, unfortunately, did not live up to his full potential, scoring five times in 29 matches. His true quality showed last season for FC St. Pauli. Ginczek’s spectacular change of pace, his ability to slow down and speed up again really confused defenders and allowed the striker to blow by them with ease. Daniel Ginczek’s right foot is the stronger of his two, as he scored 16 of his 18 league goals from his right last season, but he can score spectacular goals with both of his feet. Ginczek took 108 attempts on goal last year and created 159 chances for Hamburg’s iconic cult club. The German striker has played for every level of the German national team thus far with the exception of Jogi Löw’s senior team, totaling 20 matches of youth international play. During his time in the youth ranks, Ginczek has performed very consistently, scoring at all of levels except for the U-17s, where he only made two appearances.